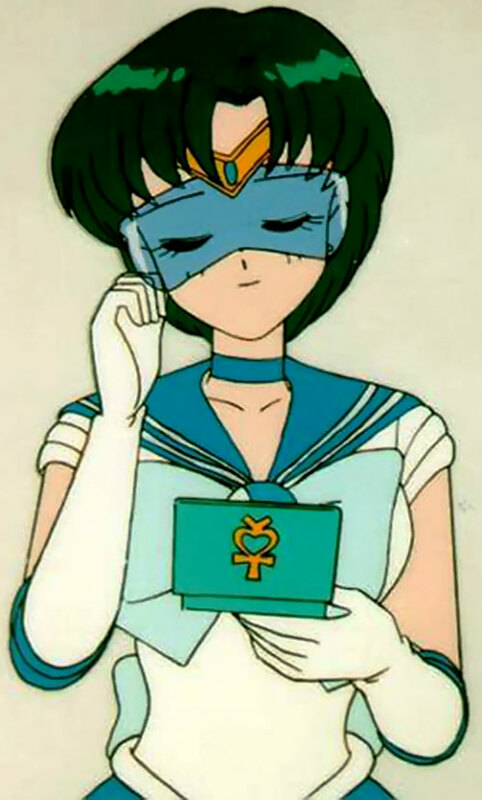 This profile covers Sailor Mercury at the end of the Dark Kingdom Arc of the television version. Since there were originally no plans to continue the series beyond that point, it is the most self-contained of the arcs. However, a few things revealed later in the series (or which are exclusive to the manga, but uncontradicted in the TV series) are referenced in this profile, in order to give it depth. The most notable instances are the divorce of Ami’s parents and some of her Skills. Group Affiliation: Sailor Senshi Base Of Operations: Tōkyō, Japan. Ami Mizuno is a brilliant girl, a scientific and logical genius. She’s also a good writer, an excellent swimmer, and a surprisingly graceful dancer as well. She is extremely mentally resilient. She could resist powerful brainwashing techniques, and shake off the illusion powers of youma (demons) rather easily. This signature attack, Shabon Spray (or “Sabao Spray”, depending on the translation), is the weakest in attack strength, but the most versatile of the Senshis’ powers. When activated, Mercury fires a stream of bubbles from her hands which pop, releasing a thick fog. The temperature of this fog is cold enough to stun or kill small animals. At D point, she used it to freeze a lava flow, but used a great number of Hero Points in doing so. She also appears to be able to use this power to generate force fields within the fog, stopping projectile attacks, abating energy attacks, or holding enemies in place. It should be noted that the Senshi Team Attack quite a bit, combining each other’s signature attacks for greater effect. 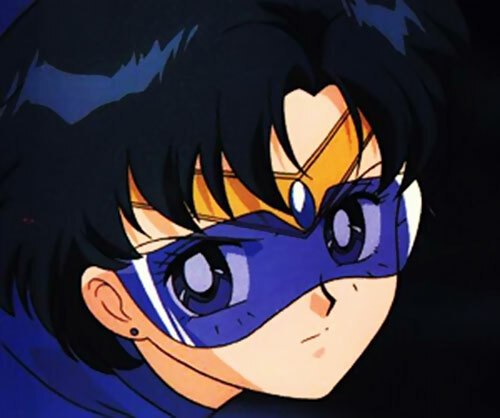 Unique among the Senshi, Sailor Mercury, the Senshi of Knowledge, possesses a powerful minicomputer, linked to a visor which appears when she tweaks her right earring. These allow her to detect enemy weaknesses, see through illusions, and to scientifically analyze objects and people. When Ami Mizuno was still a young child, her father, a famous artist, left her and her mother to retreat to his studio in the woods. He sent divorce papers a couple of weeks afterward. Perhaps this is why she has grown up embracing science and logic, striving to become a doctor one day, like her mother. Whatever the case, by the age of 14 Ami was the most intelligent student in Japan. She was rumored to have an incredible IQ of 300. Unfortunately, she was also utterly alone, her intelligence and shy personality making it difficult for others to approach her. Enter Usagi Tsukino (secretly Sailor Moon) and her guardian cat Luna. Luna sensed something odd about the quiet girl. Thinking she might be a Dark Kingdom spy, the feline investigated her up close as she was walking home from school. Ami was quite glad for the cat’s company, since she lived in a high-rise and couldn’t have a pet herself. Usagi, seeing Luna nuzzling up to the smartest girl in school, saw the perfect opportunity to improve her grades. She befriended Ami, taking her to the Crown Game Center, where the shy girl proved her remarkable skill at videogames. Ami-chan then realized she was late for cram school and left in a rush, dropping a strange computer disk as she ran out. Luna and Usagi investigated the disk at Juuban Junior High’s computer lab. They found that it contained a powerful mind control/energy-draining program. With this seeming proof that Ami was a spy, they rushed to Ami’s cram school to confront her. Meanwhile, at said cram school, ami was just discovering that the Crystal Disk the school had assigned their students was missing. This was fine by her, as using it had always given her a headache. Using her disguise pen to look like a nurse, Usagi snuck into the school. She rushed to the classroom Ami was in and yelled at all the students to get away from the computers. 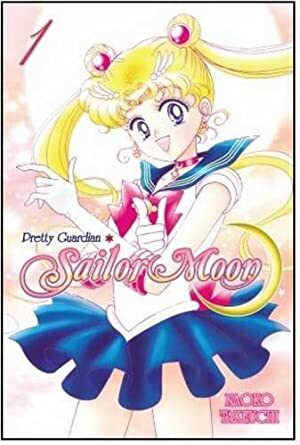 Ami told her not to interfere with their studies, and Usagi transformed into Sailor Moon in order to confront her. As it turned out, Ami’s teacher was the youma in question. It attacked Sailor Moon with razor-sharp test papers and zombified students. As Moon was occupied, the youma tried to force Ami to give up her energy, pressing her head against one of the computer monitors. 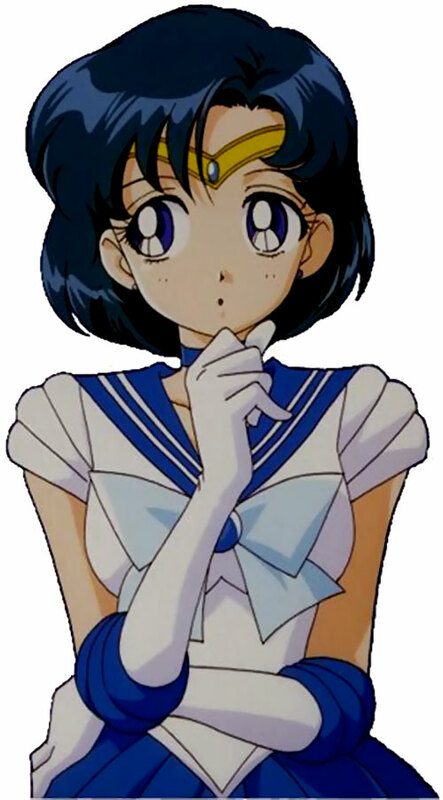 As Ami was resisting, Luna saw the symbol of Mercury on her forehead, and realized that Ami was the Senshi of Knowledge, Sailor Mercury. She quickly conjured up a transformation pen and told Ami to transform. Together, Sailor Mercury and Sailor Moon killed the youma. And thus Ami’s career as a Sailor Senshi began. 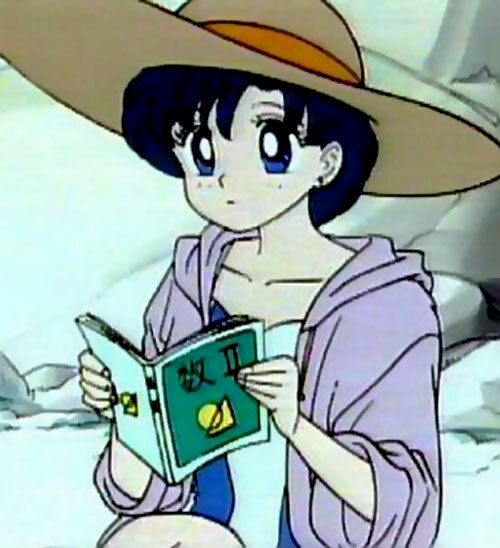 During the Ranbow Crystal saga, a young psychic named Ryo Urawa, who carried the Yellow Crystal, fell in love with Ami. She saved him from Zoicite, and he revealed that he knew who she was. Ryo also foretold that he would soon become a youma (Bunbou) and attack her. He told Ami to kill him if this happened, but she told him the future wasn’t set in stone and encouraged him to make his own future. When, inevitably, Ryo was transformed into a youma, he still remembered her words. He was thus able to resist Zoicite’s dominance long enough to attack the Dark Kingdom general. Zoicite used his power to transform Urawa even further, and took more extensive control over him. Fortunately, the senshi, working together, managed to weaken Bunbou, and Sailor Moon restored him to humanity. Urawa’s father’s job took him out of the city, but he and Ami parted on (very) friendly terms. She would later save Urawa again when the Dark Kingdom began capturing former Great Youma in order to restore them to youmahood. Ami took on Dark Tuxedo Kamen by herself, and destroyed the crystal that imprisoned the former Youma. Mercury fought alongside the other Senshi until she met her end during their siege on the Dark Kingdom’s base at D point in the Arctic. There they fought the “DD Girls”, a youma group. Ami told the others to go on without her, as her attack was the weakest, and faced their pursuers directly. Not deceived by DD Girl’s illusion of Urawa, she used her minicomputer and visor to find the source of the illusions that had been plaguing the Senshi. It turned out to be a jewel embedded in one of the DD girls’ foreheads. Sailor Mercury allowed herself to be attacked and captured so she could get within range of the DD girl in question. She then smashed the jewel with her minicomputer, just before she was killed. 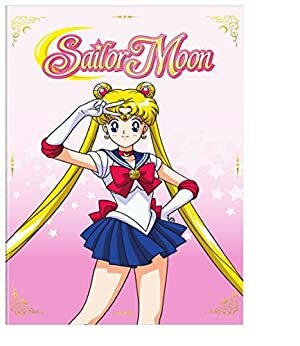 Sailor Moon then used the Silver Crystal to defeat Queen Beryl/Metallia, restore herself, the Senshi and Tuxedo Kamen to life, and to remove all memory of the Dark Kingdom from humanity’s memory. Ami was thus able to re-assume the life of a normal teenage girl. 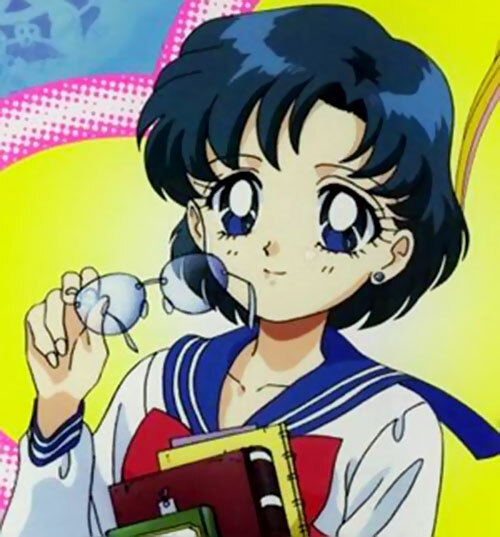 Ami is a pretty young teenager, with blue eyes and blue-black hair, usually cut very short. Her face bears a thoughtful, almost sad expression most of the time, though she’s also given to small smiles. 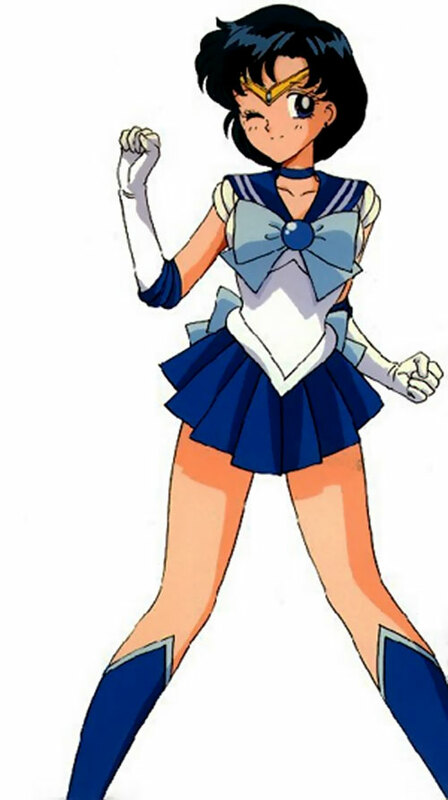 As Sailor Mercury, she wears a sailor fuku with a short blue skirt, and light blue bows on her chest and lower back. She also wears a blue choker, knee-high blue boots and white elbow gloves with blue elbow pads. Round blue earrings and a tiara with a blue jewel complete the outfit. 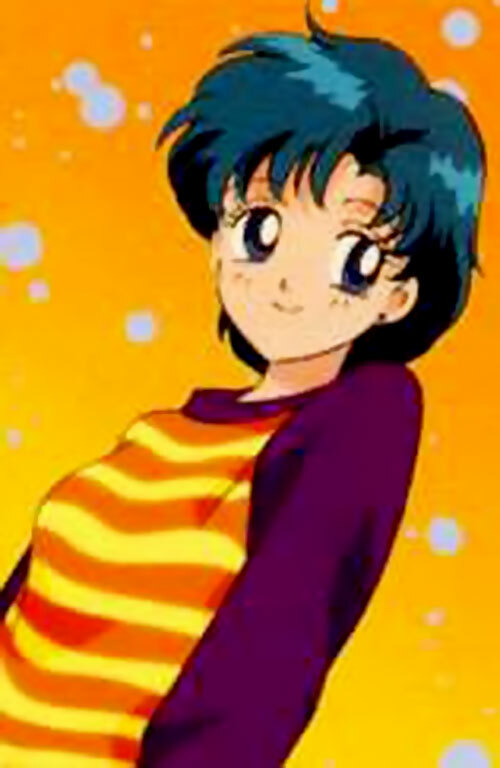 Ami is highly intelligent and observant, but also modest about her abilities and quite shy and gentle. She gets embarrassed very easily, usually whenever attention is directed toward her. Ami enjoys gaining knowledge for its own sake, and is almost always reading a textbook or educational book of some sort. She also takes it upon herself to remind her friends to study, particularly Usagi. Of all the Senshi, she probably speaks the least, but often has the most important things to say. 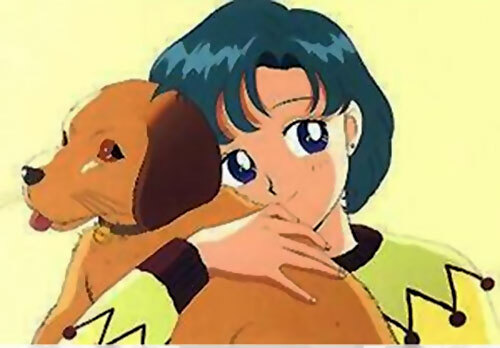 She is closest to Usagi, and regards her as her best friend. One of her greatest fears is that, had she never met Usagi, she would never have made any friends, and thus been alone her whole life. She also enjoys a close relationship with the guardian cats Luna and Artemis. In combat, she is usually the first to use her signature ability, in order to set up the other Senshis’ attacks. Otherwise, she analyzes the foe for weaknesses. She has no fear of facing opponents stronger than herself singlehandedly, such as the DD Girls, Nephrite, or the Metallia-empowered Prince Endymion. There are hardly any super heroes in Japan anyway, so the Senshi could be dropped in with few problems. However it would probably be necessary to move the Dark Kingdom’s base out of Superman’s backyard. Another idea is to have the Senshi represent the Roman gods they’re named after instead of their planets. This would probably make them part of the Wonder Woman family (and likely give them vastly different or expanded powers). In a campaign without Senshi, Ami’s Detective and Scientist skills would make her a useful contact for heroes lacking in such. Force Field, Frostbite and Glue are Contingent upon Fog. Force Field has the Range Bonus, but can only be projected within the Fog. Fog can be Combined with, and is a carrier for, Frostbite, Force Field and Glue. Frostbite may only be used within Fog. Glue may only be used within Fog. 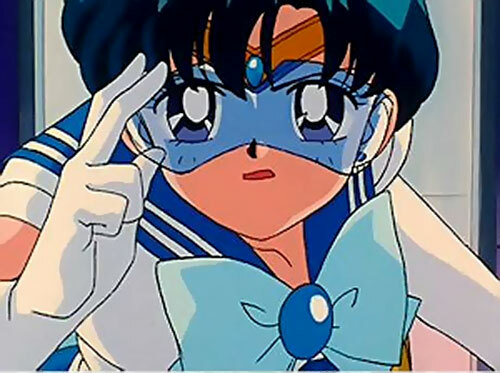 Sailor Mercury may see through Fog. Expertise (Medicine), Iron Nerves, Languages (English, German, Japanese), Lightning Reflexes, Local Hero (Tōkyō), Omni-Scholar, Scholar (Science, Math, Literature, Chess), Sharp Eye. Other Sailor Senshi (High), Ryo Urawa (High). Alter Ego: Ami Mizuno (Controllable), MIA (Shyness), MIA (Studying), Secret Identity. Minicomputer [BODY 04, EV 01 (05 w/STR), Recall: 25, Scientist: 15, Detective (all but Legwork): 15]. VISOR [BODY 01, Telescopic Vision: 11, Truesight: 15, Weakness Detection: 10]. Note: The visor and minicomputer are linked, and likely possess other vision and detection powers. Expertise (Medicine), Iron Nerves, Languages (English, German, Japanese), Omni-Scholar, Scholar (Science, Math, Literature, Chess), Sharp Eye. Other Sailor Senshi (High), Ryo Urawa (Low). Age (Young), Alter Ego: Sailor Mercury (Controllable), MIA (Shyness), MIA (Studying), Secret Identity. Transformation Pen [BODY 01, Insta-change]. Allows transformation into Sailor Mercury. Communicator [BODY 01, Radio Communications: 08, Bonuses: Radio Communication has a visual aspect, and is Scrambled]. Mercury’s signature power was probably the most complicated to figure out, but I think I got it right in the end. Ryo Urawa, a psychic in love with Ami, might be a Confidant instead of a Connection, except he no longer lives in Tōkyō. Source of Character: Sailor Moon (Episodes 1-46).